Engineering Technologies Canada Ltd. (ETC) is pleased to announce that our product division, Dynamic Monitors, will receive a financial investment from Innovation PEI to help commercialize our patented SepticSitterTM system. ETC is one of five companies selected to receive funding through Innovation PEI’s Development and Commercialization Fund. Recipients were chosen from a pool of over twenty applicants through a competitive, peer review process. “It is indeed an honour to have been selected to receive this financial support by an independent peer review committee made up of leaders from the private sector, academia and government” says ETC President, Kelly Galloway, P.Eng. “It is a real vote of confidence, in the business opportunity and our company”. Companies will receive up to $100,000 which must be matched dollar for dollar. Dynamic Monitors designs and develops innovative electronic devices which make on-site sewage systems more sustainable, effective and affordable. 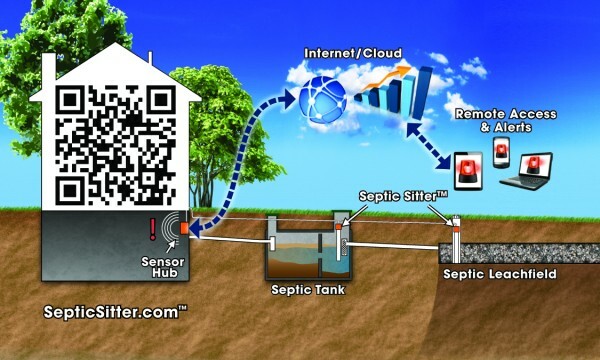 SepticSitter is an internet-connected monitor and early warning alert system for septic drainfields and tanks. Approximately 30 million homes in North America use onsite sewage treatment (aka septic) systems as opposed to centralized sewage collection and treatment. It is estimated that 40% of new home construction in the USA and Canada will rely on septic systems for wastewater management. ETC President, Kelly Galloway, P.Eng., says “Unfortunately, most homeowners don’t understand how their septic systems work, or realize that they have capacity limitations. Lack of maintenance, excessive laundry use, leaky toilet flappers, basement sump pump and roof downspout connections, are all very common ways that homeowners unknowingly cause failure of their septic systems”. According to the USEPA, every year, millions of homeowners experience public health and environmental hazards from sewage backing up into homes, or breaking out in yards. It can cost thousands or even tens of thousands of dollars to fix septic problems that often could have been prevented. SepticSitter™ will protect septic system owners from messy and costly sewage back-ups and overloads, and also document the condition of the septic system prior to real estate transfer. Problems can be caught early, and corrective action taken, rather than waiting for a full blown failure or sewage back-up. Septic SitterTM installs easily in any existing or new septic system. It uses patented, non-contact ultrasonic sensor technology. SepticSitter installs in the septic tank and drainfield and keeps watch to ensure your system is working properly. The data and reports generated by Septic Sitter can also be used to document the proper operation and functioning of septic systems prior to real estate transfer. These can be provided to future buyers of the home, or their septic inspector, to maximize property value. A demo of the SepticSitter system has been traveling the USA since October 2014 as part of Freescale Semiconductor’s Internet of Tomorrow Tour. The product was also recently showcased at the 2015 Water and Wastewater Equipment Treatment and Transport Show in Indianapolis. Feedback from industry leaders, septic installers and service providers has been extremely positive. “The main question was: When will it be ready?” says Galloway. “We have US distributors anxious and ready to start selling the system as soon as it is finished”. Next The “Internet of Things” goes underground with Septic Sitter! Hi Luc, the diameter of the lower reservoir (where the water flows out) has no bearing on the calculation of Kfs. Even though the auger has a nominal diameter (across the blades) of 2-3/4" (7cm), we have found that the actual diameter of the well hole is usually slightly larger, about 8.3cm in most cases. We determined this by augering holes in sandy loam soil and pouring a wet concrete mix into the holes and letting the concrete cure, making perfect casts of the holes. When the concrete was cured, we dug up the casts and measured their average diameter. Yes, we are very dedicated! The dimensional variables which go into the calculation of Kfs are: H (constant height of water in the well) = 15cm for our standard permeameter Q = the rate of discharge into the well hole, which depends on the cross sectional area of the upper permeameter reservoir = 53.46cm2 for our permeameter with an internal diameter of 8.25cm. a = radius of the well hole, which is approximately 8.3cm / 2 = 4.15cm for the (nominal) 7cm diameter auger which comes with our kit. There is no relation between the upper reservoir diameter and the diameter of the well hole that our auger makes. It is just a "nice coincidence" that the reservoir diameter is about the same as the well hole diameter for our kit. I say a "nice" coincidence, because our kit saves a calculation step for users who only want to determine the Percolation Time (per rate or T time) and not Kfs. Because the well hole diameter is approximately equal to the upper reservoir with our kit, users can simply measure the rate of fall, R, on the reservoir and invert the units to get the Perc Time in min/cm, or multiply by 2.54 to convert Perc Time to min/inch. Hope this helps!